Another drama took place in the judicial arena when the judge presiding over the case of treasonable felony leveled against the supreme leader of IPOB, Mazi Nnamdi Kanu, in Abuja high court, Justice Binta Nyako, suddenly announced an indefinite adjournment of the hearing of the case already slated for the 17th July 2017. It was just an uncommon expectation though not completely a surprise that has attracted so many reactions from among the various strata of citizens as well as foreigners. There have been many insinuations regarding the reason or reasons for such an embarrassing pronouncement; "what could this mean?" has been the question, and many answers that it is probably because of the quit notice is given by the Arewa youths to the Igbos living in the Northern part of the contraption called Nigeria. Some say it is perhaps an indication that the judge is trying to do the right thing in this case. There are those who say it is because the judge has come to know that Biafra is already here. 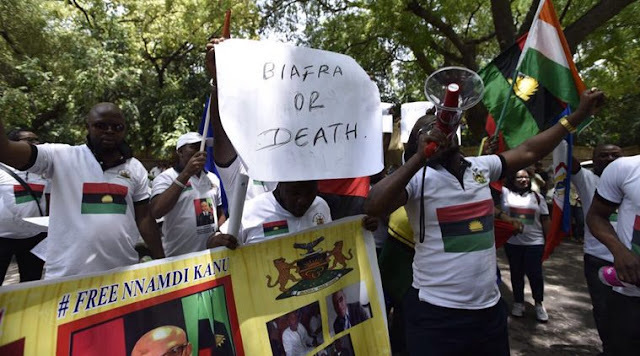 Some others posit that it is because Buhari is dead though not yet announced and there are also people who say that Nnamdi Kanu should be very careful because the government has perfected plans to assassinate him. In fact, there are many things being said regarding this dramatic adjournment. The Igbos living in the Northern part of Nigeria were expressly issued with a quit notice which would expire on the 1st of October 2017 according to the statement credited to the Arewa Youths and backed by the Northern elders. Could this be the reason for the indefinite postponement of the court hearing? If this is the reason, what argument could be made to justify it? Is it that since the Igbos are going to leave the North there is no point hearing the case now, so let us wait to see the outcome of the quit notice? If that be the case, how can the government defend the assurance it has given to the Igbos that nothing will happen to them - that they will be fully protected? Okay still on this view, is it that the government has come to know that there is going to be big crisis from October 1st, 2017 and as such there is no point hearing the case now? Well if that is the way to look at it I would like to ask if the country had ever been enjoying peace and not crisis. That is nonsense because this country has always been in crisis and would always be till the needful is done which is referendum. So personally I do not see any sense in this argument. "THE JUDGE IS TRYING TO DO THE RIGHT THING"
There are thinkers who see the postponement as a sign the judge is about to do the right thing having known quite well that Nnamdi Kanu actually has no case to answer and that everything about his arrest, detention and trial is totally illegal. They believe that the judge understands the truth but could not do anything different from the mind of the monster called Buhari and his vampire cabal friends, perhaps the judge wants to turn to the right path by taking the right decisions in this matter but to do this she would like to have Buhari out of her way, so she needs a long time to confirm that Buhari is dead so that she can do the right thing. Well I can see a little sense in this argument but it doesn’t still have enough weight to stand my criticism because some judges earlier on had declared Nnamdi Kanu discharged and acquitted even in the face of Buhari when he was not yet ill as he is now, so it would have been even easier for Binta Nyako to free Nnamdi Kanu now than it was for the first judge that thrashed out the charges against him. So I disagree with such school of thought as well. There is this adage in my place that says ‘ Nguchi Uzo Anaghi Ahia Mba Mmuo’ which means that the shutting of the door does not stop the ghost from attacking. That is the mindset of these my friends in this category. To them, the judge has seen it clearly that whether you Kill Nnamdi Kanu or you imprison him, it would not stop the restoration of Biafra and as such it does not make sense wasting time and resources fighting the inevitable. I think I see so much sense in this argument and I agree vividly with them, if this is the thinking of this judge then I think it is plausible to hearing. But If this is the reason for her decision, wouldn’t she have done it in a more honorable way to avoid this huge embarrassment she has fetched for herself. If she had asked me, my advice would have been that she declares herself no more ready to hear the case and this would have been more honorable for her than this indefinite adjournment. However, these people here have been able to convince me better than those earlier highlighted. "ASSASSINATION PLOT AGAINST NNAMDI KANU"
On this part of reasoning, some of my friends believe that Nnamdi kanu’s life is more in danger now than when he was in the prison, they argue that the time he was in detention the government knew that they were fully answerable to whatever thing that would happen to Nnamdi Kanu and now that he is outside government environment or custody, it is easier for the government to eliminate him and claim uninvolved. They argue that why is it that Nnamdi Kanu was granted conditional bail on inhuman and stringent terms which obviously remain impossible to comply with and for some level of certainty he appears to have violated most of this terms such that many fools were calling for his re-arrest, yet the government has refused to re-arrest him. Why did the judge postpone the case that was supposed to be the easiest means of re-arresting him. These people strongly warn that the life of the supreme leader is at a great danger. It might interest you to know that I strongly share in their concerns here. In as much as the international community should not claim ignorant of this evil plot nor fold their hands and watch the elimination of an innocent man, all eyes must be watchful over the supreme leader. However, my confidence is in Chi Ukwu Okike Abiama who has anointed Mazi Nnamdi Kanu for this very onerous assignment. I am certain that he will not let that evil happen against him. At this point I think it would be nice for me to say what I think about this whole drama, I think it a continuation of the cluelessness and confusion of the government and her useless agents as well as the judiciary. The judge is confused in all aspects and lacks the requisite arguments to consummate their wicked and evil plans against the supreme leader. She does not know what to do, she needs more time to go for research and/or if possible go for very quick refresher course because none of her earlier gimmicks had worked ranging from secret trial to adopting sharia law to whatever new name they would want to showcase now. Everything is all about confusion! Confusion!! Confusion!!! What madness! This is a case of confusion. "Is it to kill him? No way. To hold him? No way. To leave him? No way". ALL is confusion. But whatever the case may be, the government should be very careful with whatever decision it is taking against Nnamdi Kanu because to eliminate the supreme leader would be the costliest decision it would take if it dares.